This time last year we were cold, miserable, and damp! In contrast, today I was able to apply the final coat of stain to the well-house door well before lunch while wearing a tank top instead of several layers of flannel! I’m torn between the look with one coat of stain and that with two coats. I think somewhere in between would be perfect, but I suspect (hope) the wood grain will show through better by tomorrow. 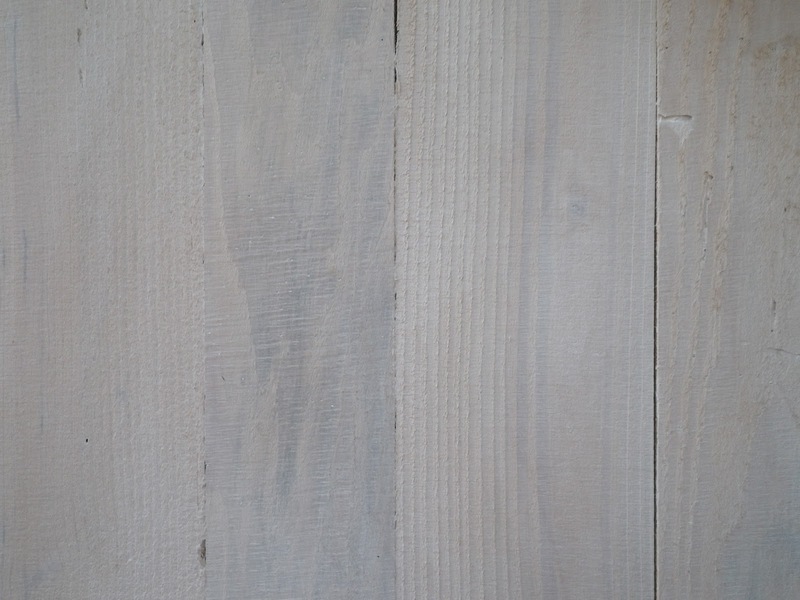 The stain (Minwax White Pickling Stain) is easy to apply and clean up. 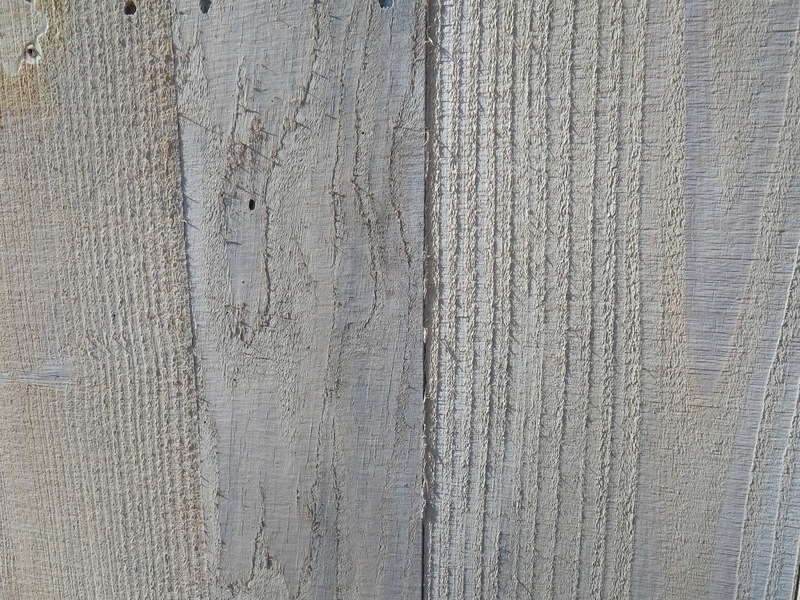 We’ve been able to keep the rustic look of the boards while having the door white enough to tie in with the trim. I did not use the pre-stain treatment as one of the things it does it stop the wood fibers from curling up. We’d want that on a kitchen cabinet, but not on this project. 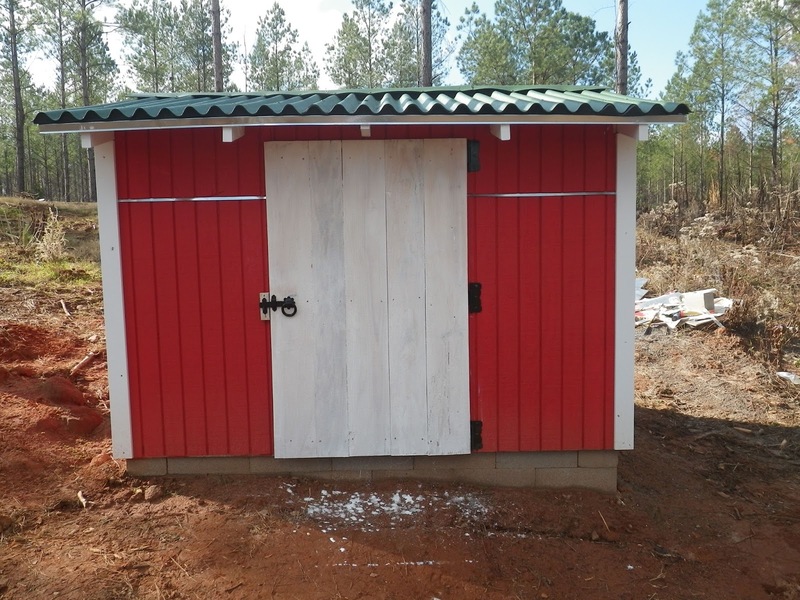 We still have some trim work left, but the well house is almost done. One more thing off the to-do list. We spent most of the rest of the morning gathering rocks from around the property to build up the area below the old clay culvert that runs under an old road bed built around the early 1900s. We cleared out some more brush around the area yesterday, and I planted some more daffodils and a weeping willow tree behind the bench. Even though the Stratford-upon-Avon council cut down the willow trees decades ago, I will always associate weeping willows with the banks of the River Avon. Although the willow is still shorter than I am, our memory-bench is already the perfect place to sit and think about family members. If the blue bells and daffodils flourish, it will almost be a little piece of England. 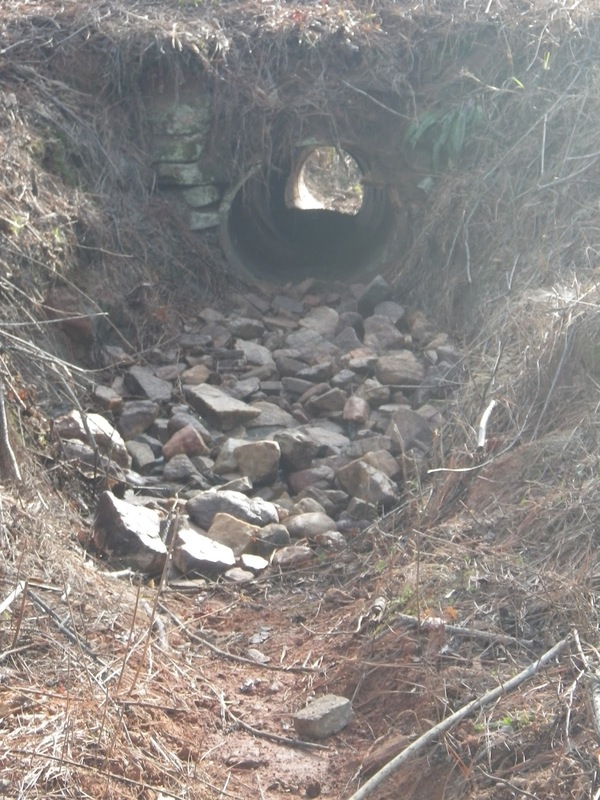 Some of the stacked stone around the culvert has crumbled away and there was a deep erosion hole below the culvert. In order to minimize additional damage, we’ve raised the level in the hole by about 2 feet and cleared the stream bed to facilitate drainage. Eventually we plan to have rock all the way to the small pool that naturally forms 90% of the year. I hear hubby throwing rocks in the cart now, but I don’t plan on picking up even one more today. We pulled some moss up from another part of the property and packed that around some of the stones further down than this picture shows, and I transplanted some ferns along the edge of the dry-stream. We’ll throw some wild-flower seeds out in spring and make the place as inviting to humans and bees as possible. Talking of bees — they too are enjoying a very warm Christmas day and the way the clover is growing bodes well for spring honey. We’ll soon plant fruit and Sourwood trees for them (and us) — hubby used the auger on the Bobcat to make planting those a little easier once we manage to get the trees down here. 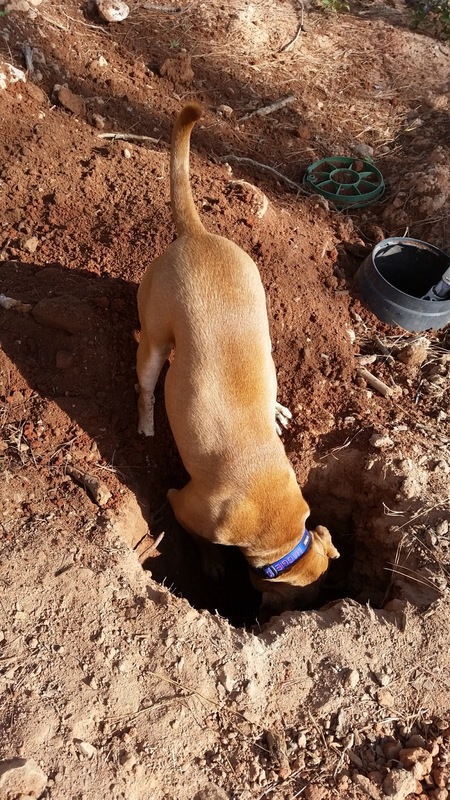 Even if the holes he dug collapse a little, digging them back out will be easier than digging hard-packed clay by hand. So our non-traditional Christmas Day is drawing to a close. The sky is turning shades of pale yellow and blue as the sun sinks behind the pines, and we couldn’t be happier. We’ve had a low-stress day puttering around the farm and supper is bubbling away in the Crockpot. When I think back to all the Christmases I was unhappy because I didn’t get the gift I wanted, I wish I learned earlier to look for happiness in other places. Other than wishing we had enough money to retire now, everything we want is right here — and not being able to retire now gives us time to actually build a house! Small hive beetles are much like vampires in that they hate sunlight, which is probably why I saw no evidence of beetles in my English hive which sits in the middle of a sunny spot, but huge numbers of beetles in our hives in a relatively shady area. Adjacent hives even have different levels of infestation, with the strongest hives having lower numbers of beetles. While I can’t turn a weaker hive into prize fighters overnight, I can do something about the sunshine, which is why I spent much of yesterday shifting the brush line further back from Bee Lane. Hives that were in the shade at 10:00 a.m. yesterday were in full sunlight this morning. We hope that helps somewhat. We have mineral oil traps (Beetle Blaster) in the hives, but our schedules haven’t allowed us to maintain them and let them do their job — which they do very well! One thing the beetles have managed to do is get me beyond being squeamish about squishing bugs! When I lived alone, my preferred bug disposal method was a vacuum cleaner stretched out at arms’ length and a can of Raid. (Sometimes the whole can, according to Hubby’s version of certain stories.) Teaching got me to the point of being able to chase a cockroach down with a broom and dustpan so as not to let my students see how much doing that makes the hair on the back of my neck stand up! Beekeeping now has me using my hive tool to squish beetles and moths and even using it to kill a roach yesterday. Sadly for Hubby, none of that translates into me taking care of bugs in the house, as there is no rational reason to be scared of creepy crawlies in the first place, I’m not even going to try to figure out why outdoor-me and indoor-me have such contradictory attitudes towards some things at times! Other projects in the works this week are staining the door to the well house with Minwax White Pickling Stain, clearing the area around the beautiful old culvert, planting trees, planting the remaining daffodil bulbs, fencing, and weed eating. More about those later. Maggie continues to enjoy the farm, and expends enough energy to power a small city while running in circles like a grey hound and digging holes in which to bury her bones. Her favorite toys when we are here are a tennis ball and empty diet Coke bottles. She is the first dog either of us has had that actually fetches sticks — it just has be the “right” stick. She also loves racing the four-wheeler and can keep up with Hubby when he’s driving over 15 m.p.h. She travels better now, which is good as she spits out motion sickness pills even when they are wrapped up in pill pockets. We love having a dog again. We love being here at the farm. We even love our tiny house on wheels. Life is good.